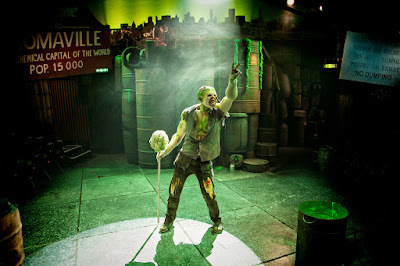 The Toxic Avenger - The Musical has received rave reviews on its European premiere at Southwark Playhouse. 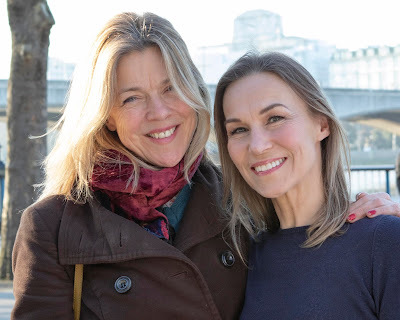 I had a coffee with "Toxie's" creator and the founder of Troma Pictures, Lloyd Kaufman along with his wife Pat, who were over in London to see the show. JB: Tell me about the creation of Troma pictures, its inspiration. LK: Well, Troma descends from a very obscure American university called Yale. It was the '60s, a time for peace and love and make the world a better place, idealism and all that. I was going to be a teacher or a social worker. I was going to teach people with hooks for hands how to finger paint, all that kind of stuff. I got put in a room (ok, God fucked up my life) with a movie nut, a guy who ran the film society and I started drifting into the film world. He was an auteur proponent and the office of the film society had a stack of magazines from the French cinematique, Cahiers du Cinéma. Being a very classy guy, I speak fluent French, so I started reading the magazines. The articles in those days were written by critics, and it was all about the auteur theory and controlling the movies and the movie should be the director's event come from the heart. I bought in to all that. We had also a very tiny bedroom. Our beds were head to toe, and at night I would inhale the stinking feet of my roommate, and the Aroma du Troma was born and I found that instead of wanting to teach the people with hooks for hands how to finger paint, I decided that I wanted to film them. The moment I decided, the exact moment I decided, was during a screening of Ernst Lubitsch's 'To Be Or Not To Be', with Carole Lombard, Jack Benny, and Robert Stack. If you want to blame somebody for Troma, go to the graves of Lubitsch, Stack and Lombard and take a picture. I mean, if you look at Picasso's work, you will see that he was inspired by the great portrait artists and all that. JB: So, referencing Picasso, do you see yourself as bringing Cubism to the cinema? LK: I see myself as bringing Troma-ism to the cinema! JB: What are the politics and the origin of The Toxic Avenger? You see the Toxic Avenger films all have a basic premise. There is a town of Tromaville. The little people of Tromaville are perfectly able to run their lives, but they are victims. Firstly of a conspiracy of a labour elite, that's the labour leaders who make millions of dollars while their constituents eat dog food. Then there is the corporate elite and we all know who they are. Finally there is the bureaucratic elite, the Congress of the United States, who have never worked a day in their life for the most part but who all are feeding at the public trough. And then you get the eco-warrior campaigning guy who runs the Environmental Protection Association or whatever it's called. He goes on to get to be made the chairman of the board of Waste Management, the polluter, the garbage company that pollutes. It’s all one big revolving door. The little people of Tromaville are sucked dry of their economic and spiritual capital, and sometimes they need The Toxic Avenger (Toxie) to save them! He lives in the dump. Oh by the way you can't say “superhero” because you get a lawyer's letter from Warner Brother's / Marvel because they own the English language! Yeah, the Elite now owns the language. There are words, “superhero”, you cannot use! This is the world we live in, you have to say 'superhuman', you know? At least we do, because we've gotten lawyers letters. When The Toxic Avenger was a comic book from Marvel they called him a superhero, but when The Toxic Avenger was no longer a comic book hero with Marvel we used this word 'superhero' and we got, ahem, a nice letter from them. JB: And what decided Toxie’s transition into a staged musical. LK: David Bryan (one of the composers) had seen The Toxic Avenger in a movie theatre when he was a kid and always wanted to do a musical of it! JB: Is there any quarter of society you would not offend? LK: I don't think there's anyone I would not mock. But I would draw the line at certain themes. LK: In other words, if someone offered me a job directing a movie that suggested that Hillary Clinton was a decent, honest, patriotic citizen……. I would stop. I wouldn't go near it, right? JB: So as America gears itself up to have Hillary vs. Donald come November, what would Toxie say, to that? LK: Well, you know, Toxie has Tromatons which react automatically. That's part of the pathos of Toxie is that he can't help himself. He kills people who are evil without wanting to! So he might very well kill both of them, I don't know. JB: A Troma movie at its most visual/visceral level is not for those with the faintest stomach. LK: Let me tell you something about the violence. Monty Python, big influence. Big influence. I mean, also, let me tell you that Steven Spielberg does real violence, right? That movie about the war, Saving Private Ryan. That was realistic! Saving Private Ryan, and Bruce Willis, Die Hard, that's real violence! Our stuff is cartoony. You cannot legislate morality. It is impossible. They've never done it. I'm 70 years old. They haven't figured out how to do it. You can't do it! I mean, what's more violent than the Bible, for heaven sakes? We just toured the National Gallery today. Giant tableaux of people with arrows in them, and, you know, it was violent! JB: You’ve had some talented people start out with you and Troma. Trey Parker who created South Park and Book of Mormon and Eli Roth who is an acclaimed horror director. How proud are you of these wunderkind alumni? JB: After this show, do you see any future Troma inspired musicals? LK: Well I made a movie called 'Poultrygeist: The Night of the Chicken Dead', which is a kind of a musical. It’s got singing and dancing and it’s about the anti-fast-food movement. JB: Finally, is there any question that you wish I’d asked that I haven’t? Pat Kaufman: You could ask him, how did you get that fabulous wife? JB: Excuse me for not asking that question! Where did you meet your fabulous wife? LK: I'm asked very often what I am most proud of. I think I'm most proud of the fact that I've been married for 42 years to the same person. And I've had the same partner for 42 years, Michael Herz. We've never had a written contract. He can empty the bank account any time he wants. - Not that there's anything in there, but he could empty it at any time! JB: Lloyd Kaufman - and Pat - Thank you for your time.